WaterNSW regrets to advise the dam site will be closed on weekdays until May 2019 as part of the electrical upgrade. Site will reopen on weekends. Remarkable for its Egyptian inspired architecture, a visit to Cordeaux Dam is like stepping back in time. Massive Egyptian style stone gateways guard the entrance to the dam wall, and the leafy picnic grounds feature stands of tall pine trees and other reminders of past times. 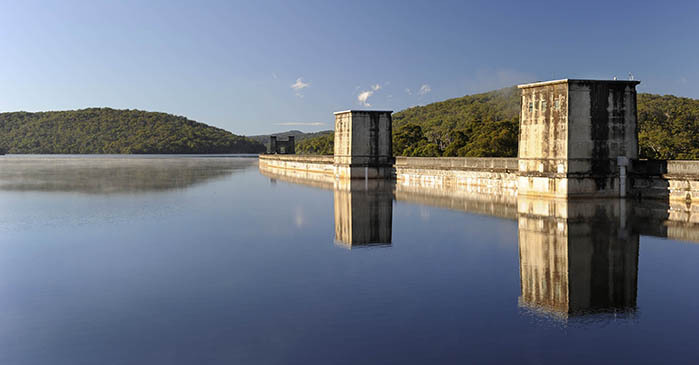 Cordeaux is one of four dams that make up the Upper Nepean water supply scheme south of Sydney on the Illawarra Plateau. The southern end of the upper picnic area carpark provides elevated views of the lake. From the upper picnic area, drive or walk along an avenue of Monterey Pines to the lower carpark near the dam wall, then walk across the wall for views of the lake upstream and river downstream. 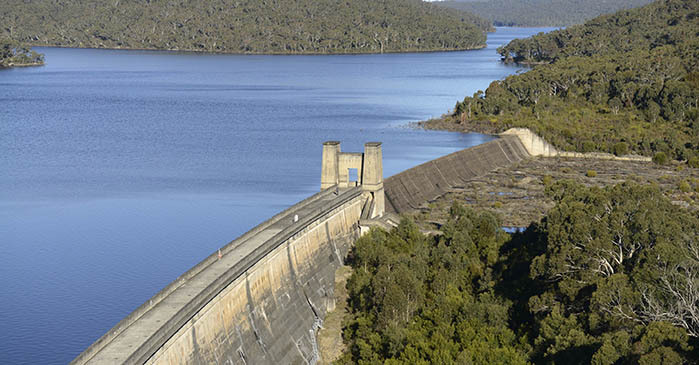 Cordeaux Dam is about 94 kilometres drive from Sydney. From Sydney, take the Hume Highway (F5) south towards Canberra. Past Campbelltown, take the Wollongong/Picton turn-off. The Cordeaux Dam entrance is about 10 minutes on the right, and is signposted. 1. Be photographed in Egypt! Stand under one of the massive stone gateways at either end of the dam wall and have your photo taken. Your friends may think you've been on holidays in Egypt! The gates were inspired by the popularity of all things Egyptian following the discovery of King Tutankhamun's tomb in 1922. Construction of Cordeaux Dam started in 1918 and was completed in 1926. After your photo under the Egyptian style gateway, walk across the curved wall of the dam. It's longer and lower than the other Upper Nepean dam walls - 405 metres long but only 57 metres high. Pause halfway and admire the views of the lake upstream. Walk to the end for an impressive view of the spillway, framed through the Egyptian style archway. Be on the lookout for reminders of the dam's glory days as a picnic spot in the 1930s and 1940s, when Upper Nepean dams competed for the most beautiful gardens. In the upper picnic area, look out for remnants of old garden layouts and a grotto between a large Monterey Pine and a very large Eucalypt. Enjoy the stands of mature pine trees and a crazy-paved stone path leading to a lower picnic area with a series of grassed terraces. A memorial garden in the picnic grounds and a plaque on the valve house on the dam wall pay tribute to Guy Chalmers Clift, 37, the Resident Engineer in charge of the dam's construction. On 10 March 1924, Clift and Constable James Flynn, 27, a local police officer, were shot while taking a suspect to Appin Police Station after a bungled attempt to steal the Cordeaux payroll. The intoxicated prisoner, William Simpson, 34, was later captured at the Royal Hotel in Appin, and was charged with the two murders. He was hanged at Long Bay Gaol in December 1924. Relax with family and friends in the landscaped grounds. Throw down a rug and enjoy a picnic - you're sitting on the site where the dam builders lived in the 1920s! Look for remnants of an old road, drains and a tennis court. Picnic facilities include electric barbecues, drinking water, toilets and a children's playground. Drive or walk along an avenue of Monterey Pines to the lower carpark and toilets near the dam wall. The wall and picnic area provide excellent views of the lake in its natural bushland setting. 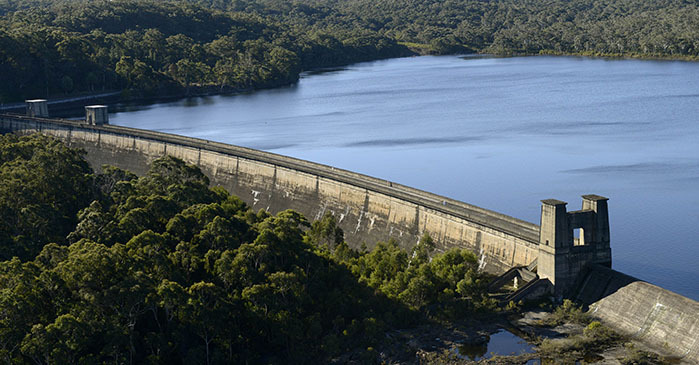 Located about 94 kilometres south of Sydney, Cordeaux was the second of the four dams constructed to collect water from the Illawarra Plateau. Created by damming the Cordeaux River, construction started in 1918 and was completed in 1926. 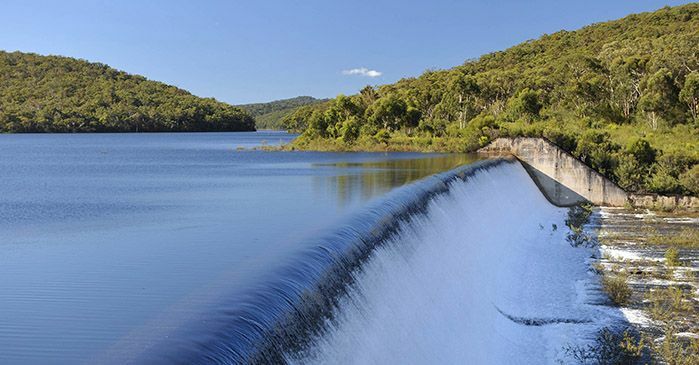 Together with Cataract Dam, Cordeaux's main role today is to supply water to Camden, Campbelltown and Wollondilly council areas via the Macarthur water filtration plant. Together, the Nepean, Avon, Cataract and Cordeaux dams also provide an additional supply of water for Sydney, via Pheasants Nest Weir, Broughtons Pass Weir and the Upper Canal. 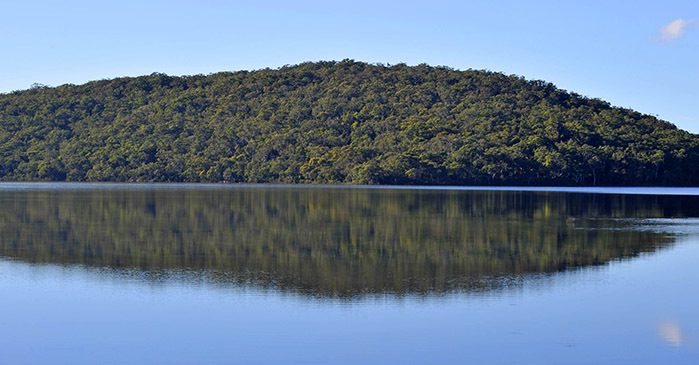 The Upper Nepean catchment south of Sydney is in one of the highest rainfall zones on the mid-NSW coast, and the area's rivers, located in narrow gorges, provide ideal dam sites. As early as 1888, two weirs were built on the Cataract and Nepean rivers to capture this rainfall as part of the Upper Nepean Scheme to help meet Sydney's growing needs. Tunnels, canals and aqueducts - known as the Upper Canal - diverted the water 64 kilometres to Prospect Reservoir. The scheme provided only temporary relief, and the 1901 - 1902 drought brought Sydney perilously close to a complete water famine. 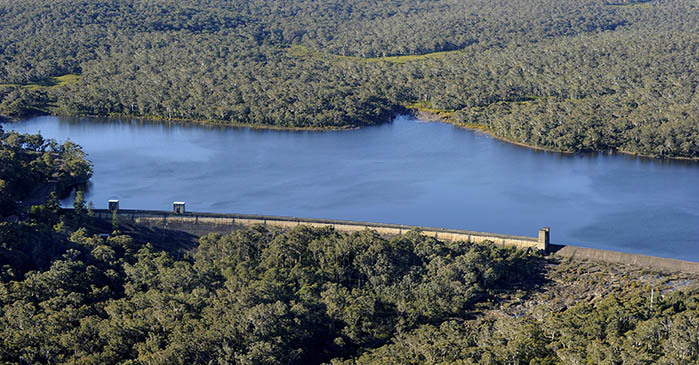 After two Royal Commissions, authorities agreed that a dam be built on Cataract River. The successive building of Cataract, Cordeaux, Avon and Nepean dams between 1907 and 1935 greatly increased the Upper Nepean Scheme's capacity. Work on Cordeaux Dam started in 1918 and was completed in 1926. The wall was built using cyclopean masonry - sandstone blocks, quarried from the site, fitted into an irregular pattern and packed with sandstone concrete. Cordeaux is a curved dam with an unlined spillway to the left of the dam wall. Cement and metal were transported to the site from the main southern railway 21 kilometres away using a five kilometre steam operated aerial ropeway built across the Nepean Gorge. The final journey was completed by a narrow gauge rail line. A township for workers was constructed, with barracks for single men and small cottages for married men. Cordeaux Dam was upgraded in 1988 with a system of drains in the wall and foundations, to meet modern dam safety standards. Trigger - Storage level has reached amber alert level. Trigger - Storage level has reached red alert level. Trigger - Spillway flows of over 46,000 megalitres per day, last reached in 1995. Notification - Flows of over 46,000 megalitres per day are being passed, levels last reached in 1995. Range - 0 to 500 megalitres per day. Notification - No notifications in this range. Trigger - When flow increases above 500 megalitres per day. 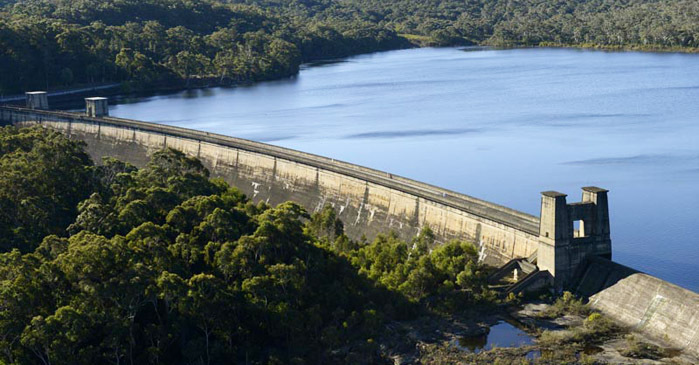 Cordeaux Dam's wall stretches 405 metres across the Cordeaux River, forming a lake that covers 7.8 square kilometres on the Illawarra Escarpment south of Sydney. 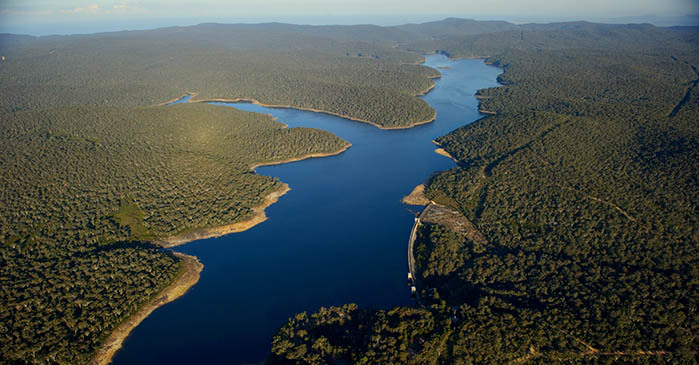 When full, Lake Cordeaux holds 93,640 megalitres of water, the third largest of the four dams that make up the Upper Nepean Scheme. 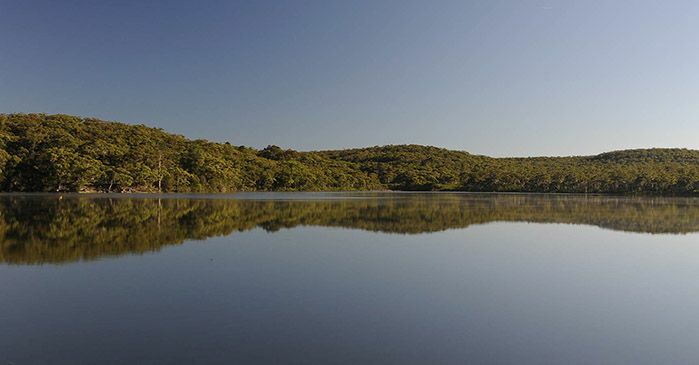 Lake Cordeaux is surrounded by rugged bushland protected by the Metropolitan Special Area. Massive Egyptian style stone gateways guard both ends of Cordeaux Dam's wall. Cordeaux Dam's spillway creates a spectacular cascade when the lake is full. Cordeaux Dam's architecture was inspired by the popularity of Egypt following the discovery of King Tutankhamun's tomb in 1922. Surrounded by the rugged Metropolitan Special Area, Cordeaux is one of four dams on the Illawarra Plateau south of Sydney. Cordeaux Dam's curved wall is made of giant sandstone blocks held in place by the wall's massive weight.